Russia has decided to safeguard its own nuclear facilities without the help of the United States. However, Russia’s state nuclear corporation Rosatom has said in a statement that Moscow is willing to continue cooperating with Washington on global nuclear security. Moscow has announced that it will no longer require assistance from the United States in protecting Russia’s nuclear facilities, but has made it clear that the decision will not threaten continued collaboration in the realm of international nuclear security. On Jan. 19, American newspaper The Boston Globe reported that the Kremlin had decided to refuse any more U.S. help in protecting Russian nuclear facilities back in December 2014 and that an agreement had been signed with Washington to that effect. This came after the Americans decided to limit nuclear cooperation with Russia, announced in a statement by U.S. State Department in March 2014. However, in an official statement released on Jan. 22, Russia’s state nuclear corporation Rosatom indicated that Russia and the U.S. will still pursue global cooperation in 2015: “Russia and the United States of America bear a special responsibility for ensuring the safety and security of nuclear materials and their reliable physical protection, preventing them from falling into the hands of terrorist organizations,” read the statement. Anatoly Dyakov, chief research fellow at the Center for Arms Control, Energy, and Environmental Studies, notes that the partnership between the two nations in the nuclear sphere has served an important purpose since the adoption of the Nunn-Lugar Cooperative Threat Reduction Program in 1992. “In the 1990s, when there were complicated economic conditions and confusion in Russia, there was a very acute problem with the security of nuclear materials. This was cause for some concern among our Western partners,” said Dyakov. One of the goals of the Nunn-Lugar Cooperative Threat Reduction Program was to jointly strengthen security and protection systems for nuclear materials with American and Russian financial resources. As a result, Russian nuclear facilities received new technical equipment, and the control and accounting system for nuclear materials underwent substantial improvement. “This was also facilitated by the improved situation in Russia and efforts made by Rosatom and the Ministry of Defense to improve the security systems for several nuclear enterprises,” Dyakov said. By helping finance the protection of Russia’s nuclear facilities, the U.S. secured the right to inspect them and monitor the expenditure of allocated funds. Moscow, however, lacked equal access to American nuclear facilities. This was the Kremlin’s chief complaint and caused Moscow to regard the partnership as unequal. According to Dyakov, Moscow has long been in a position to independently safeguard its nuclear materials on its own dime. Russia proposed scientific cooperation with the U.S. and was interested in visiting American nuclear facilities, but the U.S. declined the offer. What’s Ukraine got to do with it? Experts say the breakdown in Russian-American relations caused by the Ukrainian crisis is not the main reason behind the rift in bilateral cooperation. The sanctions simply sped up Moscow’s decision to safeguard its nuclear facilities by itself, without the financial help of the U.S.
At the 2010 Nuclear Security Summit, Russia said that every country should take personal responsibility for the safety of its nuclear materials. The U.S. curtailed some of its scientific and technical work with Russia in 2014, particularly in the nuclear field, due to the conflict in Ukraine. As a result, many crucial projects were affected, such as a joint Russian-American program to export nuclear fuel from third-party countries in the form of highly enriched uranium from research reactors. “Altogether, 2.5 tons of highly enriched uranium should be exported in the period between the launch of the program and its end in 2016. 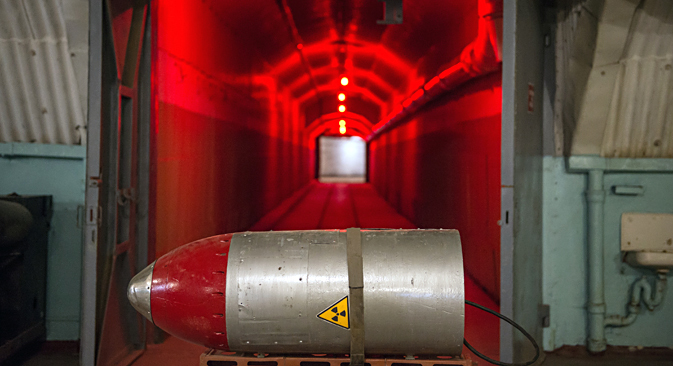 That amount is theoretically sufficient to produce 100 nuclear warheads,” Anton Khlopkov, who heads the Center for Energy and Security Studies and is a member of the Russian Security Council’s scientific board, told RBTH. According to Rosatom, the program has significantly reduced the quantity of weapons-grade material on a global scale. “It should be pointed out that this one and other partnership programs were supervised by the working group on nuclear energy and security under the Russian-American Presidential Commission. However, in March 2014, in an announcement on its website, the Department of State notified us about the suspension of work within this mechanism that we find very efficient,” the statement said. “If Washington is interested in continuing cooperation with the Kremlin in the field of nuclear security, it should be equal,” Dyakov said.